RTA's new Map Wizard lets you make instant road trip maps. Simply enter your beginning and ending points, then click to find RoadTrip Attractions along your route. A review of the new 2008 road atlas will appear here shortly. The following applies to the 2007 edition: The 2007 road atlas produced by American Map is unquestionably the best map book in its price range. It's spiral bound, printed on good quality paper, and it's a great size for reading while on the road. The atlas has maps of all fifty US states, ten Canadian provinces, and includes detailed maps for 326 cities. This atlas also has the best maps we have seen for Mexico and Canada in this price range. Two more features that we really like are the mileage and driving times map that covers the entire region between central Canada and central Mexico, and the temperature, distance and volume conversion tables on the inside rear cover. The state maps are chock full of useful, easy-to-see-at-a-glance information for locating places in adjoining states. For road trip planning purposes, the National Parks locator and the suggested drives section is excellent. This atlas is superior to products that cost twice as much. A review of the new 2008 road atlas will appear here shortly. The following applies to the 2007 edition: We purchase new atlases every 1-2 years for our personal use, and this year's edition is the best of breed. The boundaries of state and national parks leap off the page with the updated color scheme, and we find the use of the slightly muted colors for the different municipalities on each page make it much easier to use. As in past years, truck routes are easily identifiable, and the information about fuel taxes, road conditions, bridge restrictions, clear channel radio stations and other data vital to long-haul truckers make this atlas fascinating to read and use. The laminated pages and spiral binding make this atlas nearly indestructable. Yes, it's more expensive, but for serious road trippers, it's well worth the price. Not only will the pages resist spilled coffee, you can write on them with a grease pencil or "dry erase" marker and wipe it off later. Perennial favorite, updated and rendered even more attractive by a new low price. You really can't beat it for value. In the last nine years, Benchmark Maps has established itself as the best source for detailed state road gazetteers. 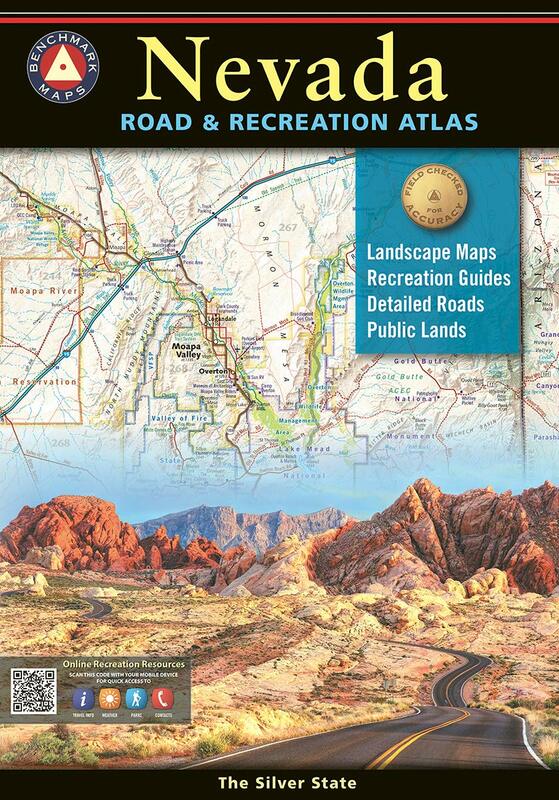 Unlike most road atlases, the Benchmark series uses landscape illustration to show mountains passes, marshes, canyons, and other geographical elements clearly. The maps look like aerial maps with elevations shown in relief, and it is easy to see at a glance if the roadway you are considering climbs up a steep pass or slogs through a swamp. These superb maps also identify little known locations, dirt roads, historical sites, and they provide the most extensive list of recreational opportunities we've ever seen in an atlas. Unlike DeLorme, the areas contiguous to the title state are included, making it easier to navigate when in close proximity to borders. Currently the series includes atlases for Arizona, California, Colorado , Washington, Oregon, Nevada, New Mexico, Idaho, Utah, and Wyoming . With over a hundred detailed black-and-white maps and hundreds of photgraphs & extensive coverage of historical events & recreational opportunities in Idaho , Wyoming, Yellowstone National Park , and Montana, these two volumes live up to their "Ultimate" name. Excellent resources for Yellowstone & Glacier National Parks. Read RTA's review. DeLorme's series of state gazetteers are a good place to turn for more detail than ordinary road maps. A blend of road atlas and topo map, the gazetteers can help you keep from getting lost when you're way off the beaten path, and they're conveniently published in book form for easy reading while driving. Something to remember when purchasing DeLorme Gazetteers is that they adhere strictly to state lines. This means that if you're exploring Death Valley, for example, you have to keep juggling between the Nevada and Southern California books. For this reason, we always carry a standard road atlas and use it in conjunction with the DeLorme Gazatteers. Spiral-bound atlas with the great detail Thomas Guides are known for. We've been using StreetAtlas USA since 1994, and it's gotten better with every new version. In this latest version, the designers have clearly focused on "building a better mousetrap" and are directly targeting the users of the industry leader -- Microsoft Streets and Trips (see next entry). While we haven't field tested DeLorme's 2006 software ourselves yet, it does seem to have some nifty features. The "avoid routing tool" has been simplified and makes it easier to block out areas that you might wish to bypass when traveling. There is also a "MapShare" utility that allows for the posting of maps and routes with a unique URL for sharing with friends and family. The voice recognition software has also been enhanced and is capable of responding to simple voice commands like "be quiet" or "next turn" in addition to providing the industry standard of turn-by-turn directions. Although the online version of Rand McNally's mapping software is good, Streetfinder doesn't measure up well against the equivalent Microsoft and Delorme products. Create your own topographic maps for the entire U.S. Includes automatic trail & road routing and realistic shaded relief or 3-D views. Discover 300,000 miles of trails, 43 National Parks, and 120 National Forest trail networks. Similar in scale to the USGS 1:100,000-scale topograpgical paper maps. The entire US is on one CD. Features trip and way-point tracking capability. Good introduction to using GPS equipment; includes a free CD with MapTech's mapping software. Distinctive design with bold colors and relief shading. Measures 70" x 49". Scale: 1 inch = 44 miles. Reproduced from the original four-color letterpress plates. Includes portraits & illustrations of historic figures and events of the settlement of the Pacific Northwest. Measures 34 3/4" x 19 3/4".